Ayurvedic Kansa Vatki foot massage is a wonderfully relaxing treatment which helps to balance body, mind and spirit. Just under an hour in duration, the treatment begins by cleansing the feet and legs, followed by some relaxing foot and leg moves. Then, slowly and methodically the toes, feet, ankles and calves are encouraged to relax through application of massage techniques carried out with the aid of oils. At the heart of the treatment is the 3-metal Kansa Vatki, a small metal bowl. 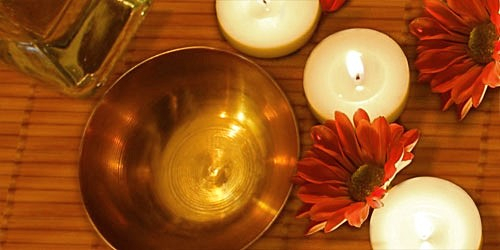 Metals are extensively used in Ayurvedic treatments and the 3 metals used are copper, zinc and tin. Copper is thought to help in reducing pain and inflammation, zinc is thought to help in the proper functioning of the immune system and digestion while tin is believed to help with digestion, relieve headaches and insomnia. Marma massage (Indian acupressure) is then performed to work the specific acupressure points - this is a traditional Indian therapy, and is derived from a branch of martial arts. there are 107 Marma pressure points around the body, 14 of which can be found on the lower legs and feet. Working these points can help to relieve certain conditions, and detoxify and balance the body's energies, leaving you feeling refreshed and relaxed. This treatment can be enjoyed by everyone and is ideal for those who spend long hours on their feet. "What an amazing treatment! I had an Ayurvedic foot massage today, total bliss."